Ideas, opinions and exploring the world through words. 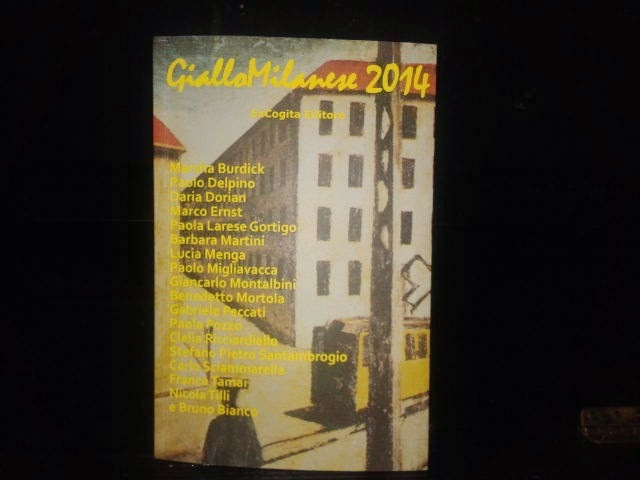 Coma was published in December 2014 in the anthology GialloMilanese 2014 from ExCogita Publisher. The original story is in Italian, and this is the official English language version. Phillip is logical - no doubt about it. He watches Rosemary sleep quietly in her bed with the pale yellow blanket pulled up to her chin. She hasn’t moved in such a long time, but now he thinks he knows what to do. At least, he hopes it will work. Dr. Phillip Milanesi was in the emergency room one day when an ambulance brought in a woman who had had an accident on the job. As he examined her that day, he asked the paramedic where they had found her. “They don’t know,” said the paramedic. Phillip examined her forehead. “So, you said she fell off a ladder?” he asked. Phillip loves his job. Healthcare means everything for him: he wants to be an example for his patients, so he swims when he can and always eats right. After all, why should a patient trust a doctor who's out of shape? He keeps himself in good health and tries to do the same for his patients, but in all this time, he has not been able to make Rosemary better. Three weeks after Rosemary entered the hospital, Phillip met with her mother to discuss her care. He preferred not to talk about such things in her room because her brain activity was good and there was a possibility that she could hear and understand what was happening around her. Her tests showed she was in a prolonged state of sleep with a REM cycle every five hours. They had adopted an IV to keep her hydrated and a feeding tube for nutrition, but Rosemary did not require any other particular care. She was even breathing on her own: twice each minute ever since the moment she was brought into the hospital. The problem, at this point, was that the hospital had decided to release Rosemary for financial reasons. Her mother was not in good health and could not take of her at home, and so she had asked Phillip to find a long term care facility. Eventually, Rosemary was assigned to a room at the top of a tower at a facility known as "The Fortress" because it had been built as a fortified house a few centuries back. The small yellow room was very picturesque, though a bit inconvenient because the elevator and the fire escape had been built on the outside of the original wall. There was a breathtaking view from the only window in the room, and marvelous frescoes still covered the walls. Rosemary's mother spent many hours there reading aloud because Rose loved romantic stories and classic fairy tales. Over the next few years, Phillip became quite famous for his research and the medical journals published a lot about his “special patient”. In fact, Rosemary was in the exact same condition as when she first was brought into the ER. The EEG continued to confirm that her sleep cycle was almost normal, and her skin and muscle tone was still healthy. Her comprehensive metabolic panel proved that she did not really need to be artificially fed, and so they removed her feeding tube to save money. Rosemary's mother had insisted they keep the IV, but Phillip was very sure that she really didn't need that either. There had never been a case like this before! The Museum of Science and Technology of Milan organized a press conference to announce the new exhibition commemorating the fifth anniversary of Rosemary's accident. Phillip went, and he was very happy to get the chance to say hello to Rosemary's mother. The poor lady seemed twenty years older instead of five. They both took seats in the front row. “The same as the past five years,” sighed Flora. “Her condition is stable, but there are no signs of recovery.” Everyone started whispering. “Could you tell us something about the new exhibition?” asked a journalist with a mustard yellow jacket. As the whispering started again, Phillip sat straight up in his chair, his eyes wide with surprise. Yes, Phillip was a logical person, but he had been looking for an answer for five long years and all his scientific knowledge had not helped at all. Wasn't it true that when only one answer remains, no matter how illogical it seems, it has to be the right solution? And now here he was. He approached Rosemary slowly, with an air of hopeful disbelief. How many hours had he spent in this chair, gazing at her lovely face and long blond braid, trying to find a way to make her open her eyes? Her mother had told him they were blue, the color of the sky. Several times, he had imagined waking her up, but never like this. Could it really be that easy? Suddenly Phillip leaned over and kissed Rosemary on the lips, and immediately he felt a wave of warmth spread through the room. Startled, he backed up as she began to inhale, slowly, for a whole minute. Her lips parted slightly when she exhaled, and then her eyes opened and, at last, she blinked. Phillip sat down on the side of the bed, dumbfounded. Don't you love yard sales? All those things priced so conveniently. All those treasures changing houses. It's a lovely tradition that not all countries share. Italy, for example, does not do yard sales. So I guess you can imagine that I don't go all that often. For those of you who have never heard of a yard sale, these are sales that people hold privately to sell their own belongings at a 90% markdown. Some people set their stuff up in the garage, and call them garage sales. The unofficial verb would be "to go garage sale-ing". You don't need a permit or other type of authorisation. Outside the US, I'm sure you have second hand shops, or maybe you just donate your used items in good condition to charities. Maybe you could find a bookcrossing point to get something to read free. I've been to several sales already this year, and here are a few of titles I picked up. I like to read different types of media, and I love to try out different platforms. So I have accounts on both Wattpad and Goodreads. For those who don't know, Wattpad is a platform for writers to share what they've written and create content for their readers. I posted the Italian version of the Coma short story I wrote two years ago because it is no longer available on the Giallo Milanese website. You can find the English version here on my blog. I'm working on a new story and today I wrote 640 words. Goodreads, on the other hand, lets you write reviews about books that you've read, and you can keep track of what you are reading - and what you would like to read in the future. As usual, I'm currently reading three different books: two paper books and a digital version on my phone. I also have another ebook on my tablet that I have barely started. I have a stack of books that I want to read. I haven't measured it lately, but it's probably taller than me. Now, before somebody comments on my height (or lack thereof, I should say), let me add that in addition to the physical paper books that I own, you need to count the over 100 ebooks that I've downloaded over the past year. In fact, I just don't read those emails from Read Cheaply that often any more because I always find something to download! Right now I'm reading The Storied Life of A.J. Fikry by Gabrielle Zevin. I found this book before Christmas at the Lambrate subway station. As I came down the steps that day, there was a man coming through the turnstile shouting and cursing at complete strangers. He was livid with anger, and as I tried to avoid him, I happened to see a book setting on the newspaper dispenser with the Italian title "The measurement of happiness". I'm a freelance writer, translator and CELTA certified teacher of English as a second language. Sono una libera professionista: scrittrice, traduttrice e insegnante d'Inglese con certificazione CELTA.